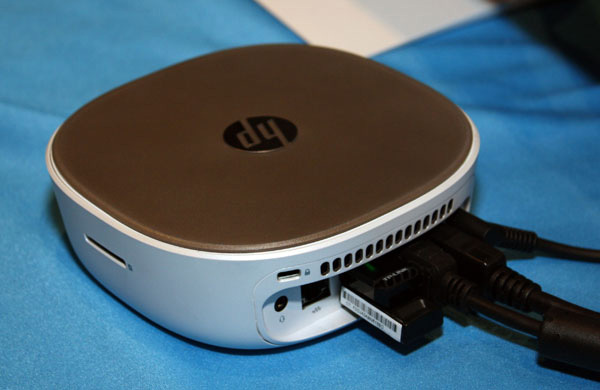 The HP Pavilion Mini is a desktop PC shrunk in size. It shows how far technology has gone – now you can have a fully functional desktop PC which you can fit in your coat’s pocket. It’s not as compact as Intel’s PC on a stick, but the Pavilion is quite the stylish box that barely takes space on your desk. Got a book there? Swap it for the Pavilion. But has HP focused more on making it super-small, and completely disregarded adding features? Check our HP Pavilion Mini Review if you want to find out more. 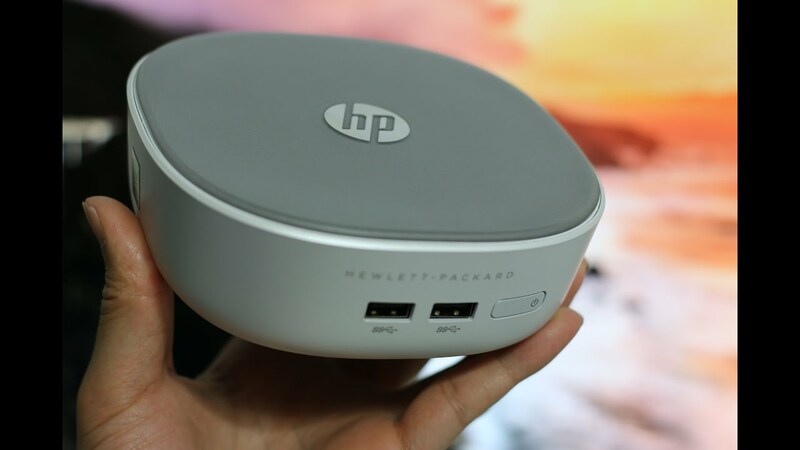 Arguably, the HP Pavilion Mini is one of the best looking petite desktops on the market. It’s about half the size of a takeaway box, but a ton more appealing than Wu Xing’s Orange-filled duck. The plastic, which is soft at touch, is smooth, and clean with a minimalist vibe to it. It’s cuboid-shaped, with its corners and sides curved. It has ports, and cooling grills on its sides. On top of the HP Pavilion Mini you’ll see the Hewlett-Packard logo. It’s held in its place by the silver chassis which encompasses the whole device. Unfortunately, it doesn’t sit that tightly, and it wiggles a little bit when you touch it. But build quality is more than pleasing, and the plastic doesn’t feel like that cheap kind. Nor does it shiny in a tacky way. At the bottom, you’ll find cushions of black rubber that helps the Mini keep his balance, and stability on your desk. It weighs 650 grams. However, it feels heavier because of its compact form. This isn’t necessarily a bad thing, as the Mini can be easily carried in your coat’s pocket. It measures 14.4 x 14.4 x 5.2cm, which makes it a tad larger than Intel’s Compute Stick. Nonetheless, still, very small. You’ll definitely find some space for the Mini on your desk – no matter how much stuff you already have on it. Setting up your HP Pavilion Mini isn’t hard at all. Have you set up a Windows PC before? Then you don’t have anything to worry about.Even if you never installed a desktop, it won’t be hard at all. Follow the instructions in the manual, and you’re golden. However, HP didn’t provide any cables in the box. You only have its charger. If you want to connect your HP Mini to a monitor via HDMI, or Display Port you’ll need to buy your own cables. You can connect two screens at once using both ports. After you’ve successfully connected your Pavilion to a monitor, you need to follow the on-screen instructions – they are precise, and clear, they leave no room for confusion. There are four USB ports on board which you can use to connect a keyboard, and mouse. You’ll then begin the standard Windows 8.1 setup process. You have the option to upgrade to Windows 10 for free, but I recommend a little bit of patience on your part. Nobody knows how Windows 10 reacts to the HP Pavilion Mini. HP bundles the Pavilion with a dizzying variety of apps. Some of them are useful, while others are just bloatware. The HP suite is included – Connected Drive, Connected Music, Support Assistant, SimplePass Security, and Connected Photo. The Drive, Music, and Photo apps are worthy alternatives to Google’s Drive, or Apple’s iTunes. But Support Assistant, and SimplePass are just simply infuriating. SimplePass remembers passwords, so you don’t need to. It’s useful, but at the same time annoying, and irritating. Why? Because it fills your screen with banner pop-ups trying to lure you to use it. Support Assistant, however, is HP’s proprietary Control Panel. It crashes more than a fresh install of Internet Explorer. Trying to sweeten the deal though, HP offers a free Dropbox storage of 25 gigs, but it expires after six months. You’ll receive three months of Evernote Premium for free, and a one month trial of McAfee LiveSafe. If you don’t think that’s enough, you’re on par with HP. They are also providing a free copy of Farm Frenzy, and ten sessions of Plants VS Zombies. That’s a sweet deal, said no gamer ever. You’ll also receive Mysms, which allows users to send, and receive texts on the Mini. The base model is equipped with an Intel Pentium 3558U dual core proc, and 4 gigs of RAM. There are two other models available, which are higher-grade. The basic HP Pavilion Mini setup is aimed at handling light tasks, and is in no-shape capable of rendering, or serious gaming. We witnessed the Mini of providing a lackluster, and sluggish experience. The Mini crashed on the first day. Definitely not a good start. Apps took too long to launch, and the mouse cursor froze occasionally – even though only Skype, and Firefox was open. The Mini isn’t a multi-tasking PC. It tries to be, but it falls on its rubber cushions. But the Mini remains usable even when lag from playing videos appears. Animations stutter, and the cursor gets out of control pretty fast when you try to do more than one thing at a time. Breaks are needed for the HP to function. You will push it over the edge if you use it more than 10 hours. It will become unresponsive to your commands, and a complete reboot will be needed. It comes packed with a 500 gig internal storage. On its front, the Mini offers two USB 3.0 ports, and a SD card slot. There’s a Kensington security lock on the left, and continuing towards its right side, you’ll find two USB 3.0 ports, the Display, and HDMI ports, and of course the Ethernet socket. Lastly, you’ll find the charging slot. The HP Pavilion Mini runs Bluetooth 4.0, and the standard 802.11bgn Wi-Fi. Should you buy the HP Pavilion Mini? If you’re looking for a casual desktop to browse the web, and watch the occasional video, the Mini seems to be a good option. Seems to be. If you want to use it as your main PC, and multitask, then no-deal. You might consider buying a higher-grade model, but it’s not worth it. Performance problems are all present, and even though HP offers it packed with goodies, most of them are useless. The base model costs $390. Not that cheap, considering that you can get the HP Stream 11 laptop for $250. The next Mini in line costs $550, and it will still come equipped with only 4 gigs of RAM. The higher-level Pavilion offers 8 gigs, and is priced at $720. It’s overpriced for what it offers. Indeed, it is better than Intel’s computer on a stick, but it’s double the price. It looks pretty darn nice, but I wouldn’t use it more than one day. Once I’ve seen what all the fuss is about, I’ll sell it on craigslist.